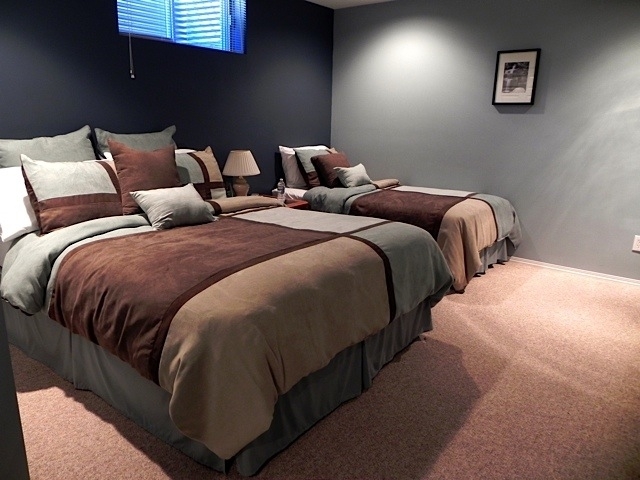 A detailed description of all of the guest room accommodations that are available at Bonaventure Bed and Breakfast in Calgary. This room includes a large closet, HD TV, clock radio, robe, free wi-fi and central air conditioning. Guests also have full use of the lounge room beside this bedroom. It contains a fridge, microwave, toaster, kettle and dishes. There is also a 32" LCD in the lounge room with over 200 channels including HBO. This room includes two twin bed which can be joined together to make a King sized bed. 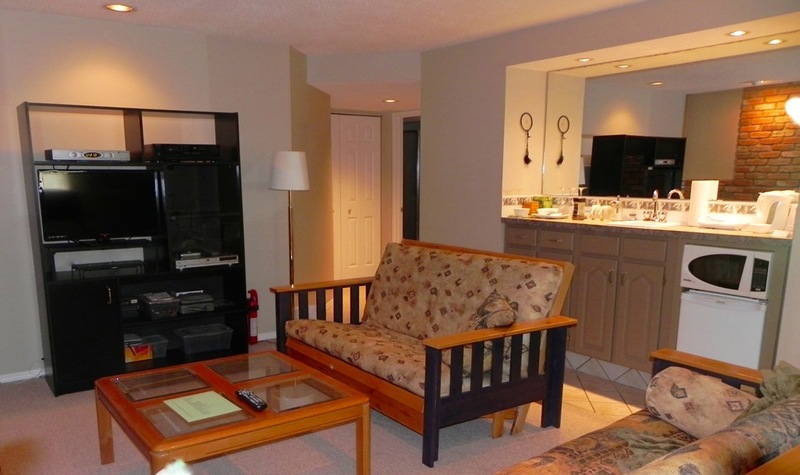 There is also an HD TV, a large closet, robe, free wi-fi and central air conditioning. Please specify either King or Two Twins in your Comments when requesting a reservation for this room. This bedroom includes access to the lounge room next door. It contains a fridge, microwave, toaster, kettle and dishes. There is also a 32" HD LCD in the lounge room with over 200 channels including HBO. Lower Level Triple or Queen Rooms with lounge. Our lower level includes both a room with queen sized bed and a room with a queen and a single bed. Both rooms include a large closet, TV, clock radio, robe, free Wi-Fi and central air conditioning. Guests also have access to a large lounge room with sink, fridge, microwave, toaster, kettle and dishes. There is also an HD 27" LCD in the lounge room with over 200 channels including HBO. Here are two photos of the upper level lounge room for guests. In addition to the desk there is a 32" high definition LCD TV, a tea/coffee amenities cabinet and a comfortable sofa. The amenities cabinet includes a microwave, fridge, kettle, toaster, cutlery and dishes. Enjoy over 200 channels including HBO.